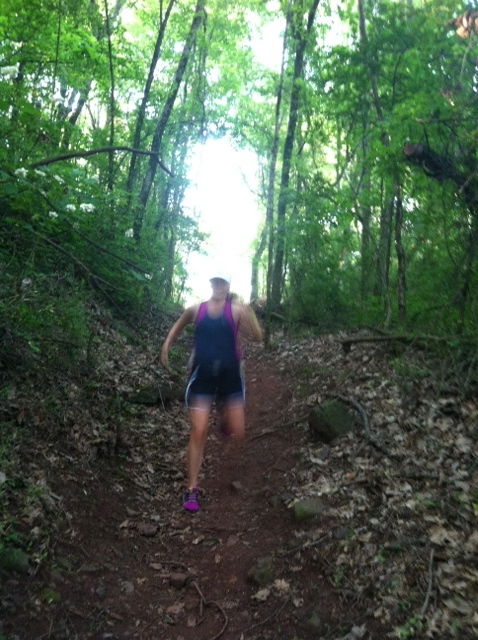 For the most part, this weekend taught me that taking pictures on trail runs is impossible. Here are some that you won't want to miss. If you like impressionism, these are your bag. My brother took those, but mine are even worse. I couldn't even get it right when my subject and I were both standing completely still. Sorry, bro, but those zip lines behind you look pretty coolish. 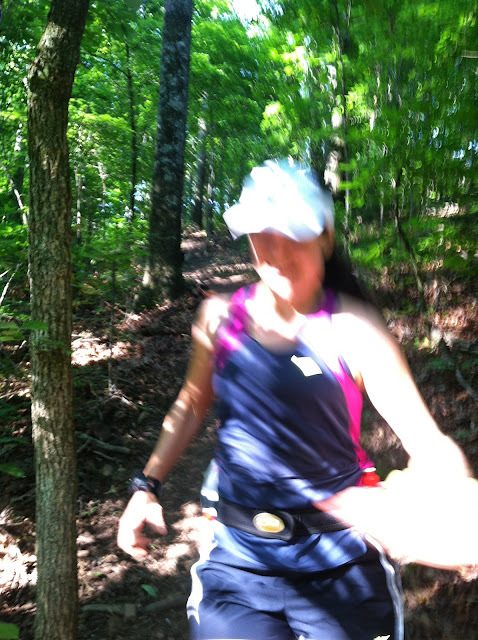 But back to the beginning, I decided to wear a hat because of the tick situation when running under trees. Ticks with their diseases and fever-nesses freak me out. Good decision: represent Oak Barrel. Bad decision: wear a white hat to Red Mountain. So when they call it Red Mountain, that also means if you fall you get pasted in red dirt. Just something to think about so that you completely avoid wearing anything white to Red Mountain. The park didn't officially open until 7 a.m. There's a very jumpable gate at the entrance to the trail. Not saying anyone should do or did that. Guess what else they have? Toilets! Portable ones, but in case you drive up and realize that you've got to take care of biz before trying to run 10 miles, don't drive 15 minutes back to the sketchy Shell station. This may or may not be speaking from experience. At a stand near the toilets, there are also paper maps available for $1 donation. We took this picture to help us navigate. 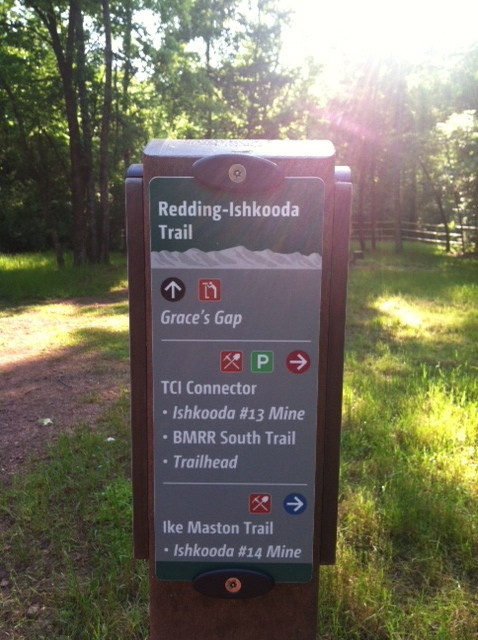 Combined with the great signage they have up now, we had no problem navigating the trails. We pretty much stuck to the trails at the perimeter of the park and added an out-and-back to Grace's Gap Overlook, putting us at about 7.5 miles for our run. The inner trails in the park are definitely the most technically challenging terrain but also the most interesting! These outer trails are pretty wide and flat, but there is still an occasional root to report for lazy-foot-nemesis duty. He looks pretty innocent. My bloody knee wasn't fooled. 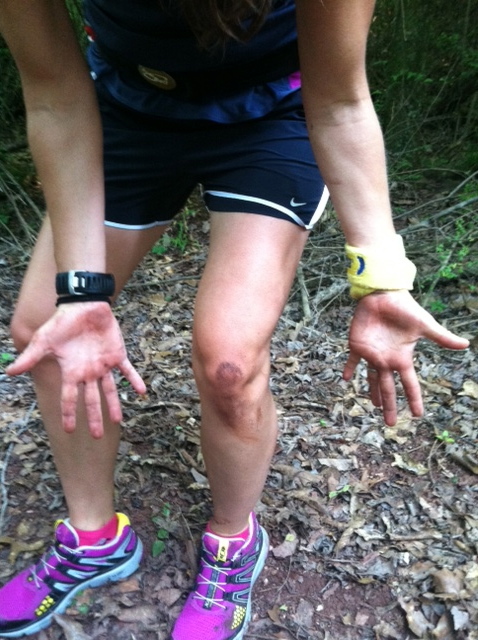 Even though falling is one of the hazards of trail running, it's also sort of my favorite part. I like having bruises and scars to prove that I did something. It's just another way that soccer has tainted my outlook on life. 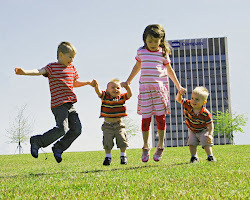 Every time the hand sanitizer stings the cuts in my hands, I remember the awesome run I had with my big brother. And I remember the time I stood by these old mines. I'm pretty sure my right arm was poised to start square dancing, my other hobby. The first overlook we came to. The green just goes on and on, except for the hiccup of that factory right there. Do you have kudzu in your state? It's taking over this part of the trail. It kind of reminds me of what happens with laundry in our house. You swear you totally took care of that yesterday, and when you turn around you get trapped in a massive mound of the stuff. Small children would definitely not make their way out if they made their way in. There's the Magic City rising from the green. If you're thinking of heading to this park, it's cool to read the history of the mines and how they pretty much put Birmingham on the map. 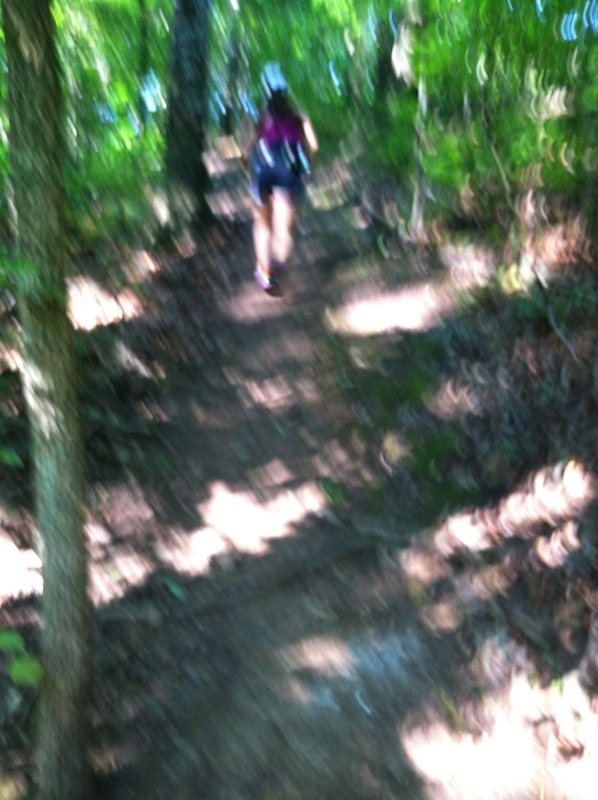 Have you been trail running lately? Falling while running? Crappy or funny? 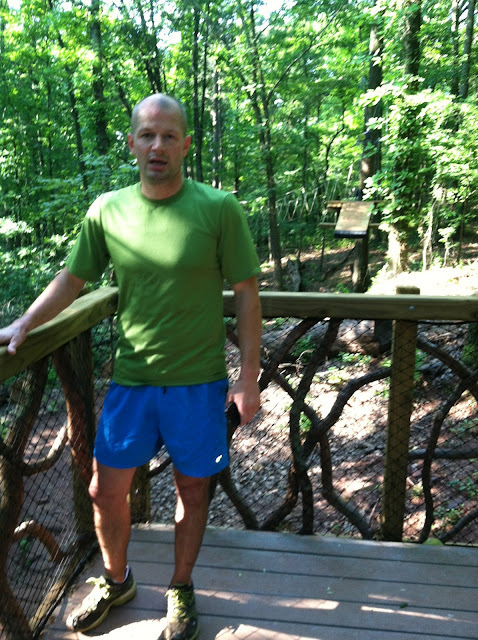 I fall every single time I do a trail run--usually on my chest and knock my breath out for a few seconds. Not fun!!! Ouch! That definitely qualifies as crappy! Ohhhh...looks like fun! I need to get out there and check it out. Missed you at the TS last night. Yes! I was so sad I didn't go. We went to the activity for my daughter, and they decided to reschedule. Looks like so much fun. Am hoping to someday live in a state with trails that do not include cactus and poisonous stuff so I can give it a go without coming out with thorns. Freaky! At least when I fall it's mostly dirt and a few pebbles. At my race on Saturday, someone did mention poisonous snakes, but I figured the snakes were smart enough to stay away from the trails with so many people pounding them in one day. But when you're the only out, it seems a lot more likely. I'm doing my first trail run Monday. Apparently I'm crazy because I signed up for a trail run/swim/canoe adventure race without the ability to do any of those activities very well, if at all. Yes, I is smart. I'm counting on my God given athletic prowess to see me through (yikes). 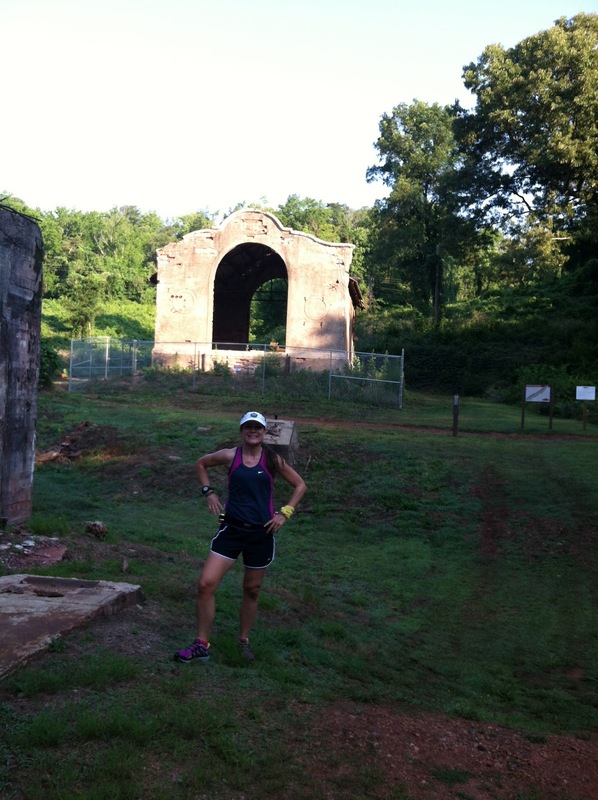 I have a trail run question for you: do you think I should buy trail run shoes? I don't really want to drop the dough on that, my plan is to wear my next oldest running shoes with my new inserts. What do trail shoes offer that normal running shoes don't? I ran trails for a while in my street shoes, but it really tore them up quickly. If you have an older pair you don't care about preserving, I would wear those. The ones I just started to wear are the Salomon xr missions. I'm testing them for the company, but I really like how thy grip the trail. The extra tread is really nice, and I definitely feel like they will hold up better to all of my tripping. Good luck in your race! 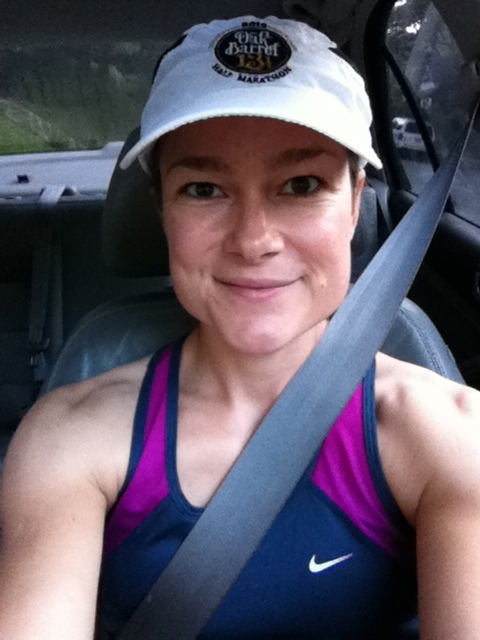 My race this weekend was my first trail race, and the dynamic of athletes felt different in a cool, laid back way. I LOVE trail running.... try to go as often as I can, which means about once a week in the non-winter months. I worry about actually hurting myself when there is a big goal race coming up! That is crappy! You guys probably have some cool trails near you! Wow, that's gorgeous trail running!! I live in the desert so our "trail running" is nothing like that!! Thank you for sharing your adventure with us!! Yes, the green is pretty amazing. I wonder if kudzu could even grow out there. Maybe in Northern AZ?! People try to grow grass here but..I don't see the point. Weeds grow pretty well, though! 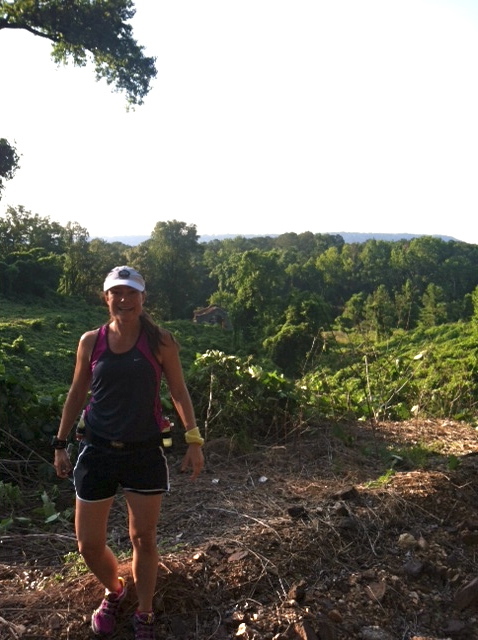 I love trail running and have been doing more of it since becoming pregnant. It's so much easier on your joints! Definitely harder, but I don't seem to notice as much since it is soooo gorgeous out there on the trails. I haven't noticed any kudzu out here. This looks gorgeous! I'll have to ask Allan if he has ever been there. Sorry about your fall but I'm with you about scars. I like mine-there's a good story for all of them! 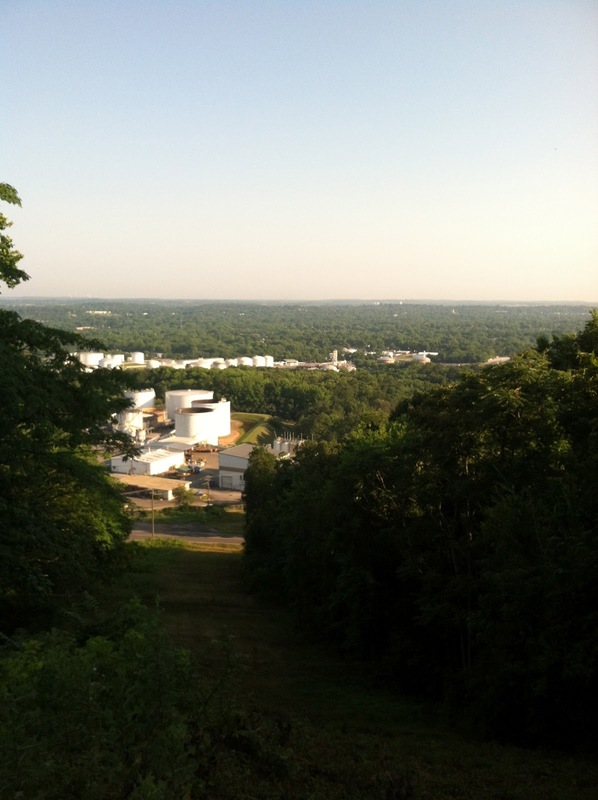 We actually just went running there 2 weeks ago and it was awesome! Except we stayed on the inner trails and got a little turned around. I've fallen in the road running and I've definitely fallen off a bike on the trails, but I have yet to trip on foot on the trail. I'm sure it's only a matter of time. And I vote CRAPPY! I have actually only done one trail run in my life. It was on Australia. 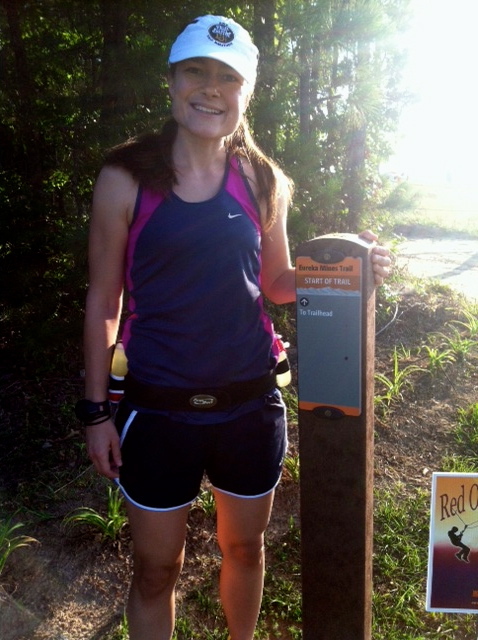 I did a 9 mile run trail run after spending a month in the outback backpacking 20 miles a day. It was pretty awesome! I was JUST thinking I need to get back into it!!! And falling is totally crappy!!!! OK, that is amazing! What a cool adventure! Just read in your comments that you're testing the Salomon's - when I was poking around looking at trail shoes, I saw them. I like their look! How did you get a shoe testing gig? I'd be all over that in a heartbeat. I've never run trails....... but I may have to stop by and run this one! You made it look almost fun! This one is great! We ran Moss Preserve today, and it wasn't as clearly marked as this one. But Moss had some really cool rocks throughout.